If you wonder what the Microsoft surface hub is about; you need to go back to 2015 when Microsoft launched its first version of digital whiteboard, a high end conference-room tech application. Meant entirely for business purpose, the surface hub with its high-definition display enabled document collaboration and video conferencing. Well-known for its obsession with giant touch screens; the tech giant is set to unveil the next-gen surface hub 2 with cool features creating dream conference scenarios. The earlier surface hub came with a large 1080 p 55 X 84-inch touch-screen display and 4K resolution cameras. It has served 5000 companies worldwide among which half belonged to Fortune 100 companies. Although it is not sure that how many surface hubs are used by each company; but the cool Microsoft surface hub 2 features would likely make it more attractive for many other organizations. In the evolving work-culture where teamwork is being increasingly considered vital for business performance; this surface hub facilitates in unlocking the power of a team. With the help of giant display screens, each team member can share anything from concept to construction; whether they are located in the same/different rooms or are miles apart. Such a high-level of collaborative working is likely to drive in fives times higher performance. 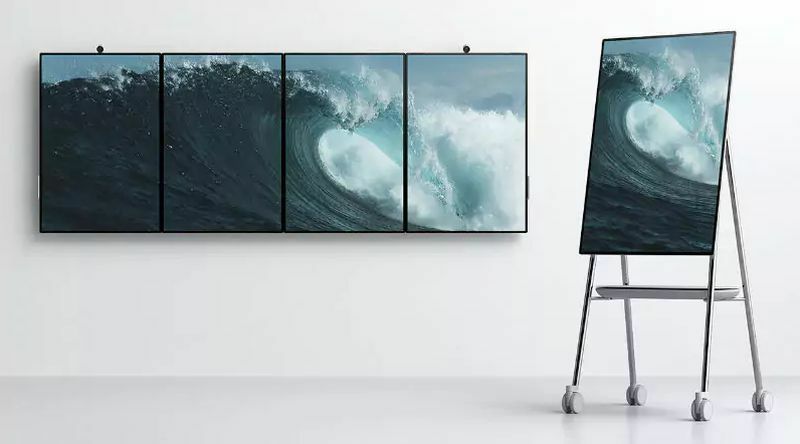 Compared to its predecessor, the next-gen Surface Hub 2 will come in a 50.5-inch display with more than 4 K resolution. The most striking feature of this digital board is that it can tile up four screens in the portrait or landscape mode; allowing better collaborative work at the same time. Tiling, the term coined by Microsoft; means that users can view different contents in 4 different screens side-by-side within the same display system at the same time. The users can also rotate or roll the screens around the custom-made steel stands. The same 3: 2 aspect ratio is maintained in the display as with other Microsoft surface mobile devices. This means the user gets more space to work and collaborate. Apart from the stunning hardware features, Microsoft is also working on the software development. 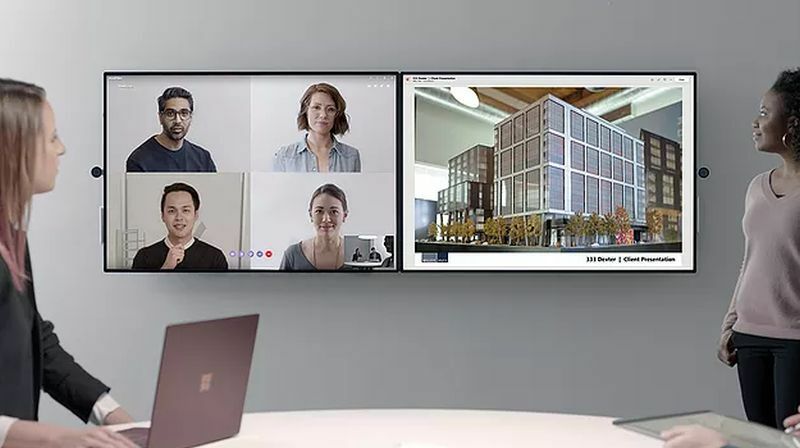 Although the new surface hub is designed for Microsoft Apps running on Windows 10 along with Microsoft Team, Microsoft Whiteboard and Office 360, it will allow a dynamic collaborative scenario. Multiple users can log into the surface hub using the inbuilt fingerprint reader and can pull their own work for a collaborative purpose on the same platform on the real-time basis. The software optimized 4 K cameras and far-field microphones will set up a video-call platform in the portrait mode with multiple users from different locations viewing the presentations at the same time. The new Microsoft surface hub is lightweight and therefore is easily movable from one room to another. Microsoft in collaboration with Steelcase is working on to create sturdy lightweight stands and wall mounts. This will give the users more flexibility in putting up the digital display board in their preferred position. Microsoft is also ahead of its competitor Google in this aspect. Last year, Google launched its digital whiteboard Jamboard with a price tag $5000. This is $4000 lower than the Microsoft’s previous 55- inch Surface Hub. Google’s Jamboard is not well integrated as Surface Hub and this has kept Microsoft much ahead in the race. The company has indicated a competitive pricing in line with similar devices, which is likely to counter the Google’s whiteboard price. 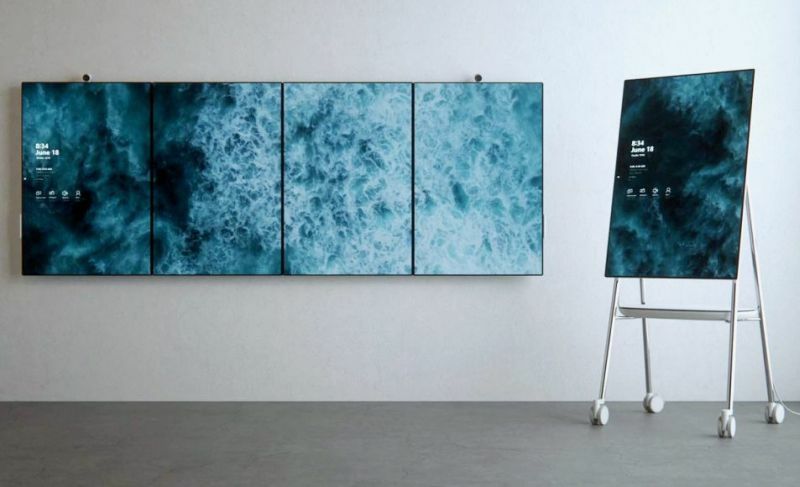 After serving more than 5000 businesses in 25 countries, the company will be able to sustain its hardware manufacturing costs by simplification of the display of Surface Hub 2. The product is likely to be available by 2019 to selected commercial customers. Microsoft is gradually inching towards its vision in creating innovative work experiences heralding the importance of collaborative work. This gives a platform to unleash the workers’ creativity to the highest level. Imagine the time spent and frequent distractions in multiple presentations sharing in a conference. Using the surface hub means shifting the meeting or conferences to real-time collaborative work experiences. The original version allowed a meeting or conference with a single touch-screen digital board. Its latest version allows multiple users to share and collaborate overcoming all barriers, improving team efficiency and obviously generating real business value.